In renovated, modest but comfortable rooms in the Humanities Building, UW-Madison donor and Major League Baseball commissioner Allan “Bud” Selig will work on his memoirs and participate in the life of the Department of History after retirement next year. Personal touches — and a direct connection to Major League Baseball televised games — have been added to what was previously space in dire need of repair. Major League Baseball Commissioner Bud Selig reacts after throwing out the ceremonial first pitch before Game 5 of baseball's National League division series between the Milwaukee Brewers and the Arizona Diamondbacks Friday, Oct. 7, 2011, in Milwaukee. In renovated, modest but comfortable rooms in the Humanities Building, UW-Madisoni donor and Major League Baseball commissioner Allan “Bud” Selig will work on his memoirs and participate in the life of the Department of History after retirement next year. Personal touches — and a direct connection to Major League Baseball televised games — have been added to what was previously space in dire need of repair. One piece of artwork in Bud Selig's new office is baseball material fashioned into a flag. At first sight on entering the Department of History’s renovated offices for Allan “Bud” Selig, a visitor is offered a Milwaukee Brewers schedule and, the classic baseball player supplement, Double Bubble gum. Florencia Mallon, professor of history and the department's head, works in Major League Baseball commissioner Bud Selig's new office in the UW-Madison's Mosse Humanities Building. Media guides for most every team in Major League Baseball sit on a shelf in commissioner Bud Selig's new office in the UW-Madison's Mosse Humanities Building. A small jar of infield dirt from Milwaukee's County Stadium (which was demolished in 2001) sits on a shelf in Major League Baseball commissioner Bud Selig's new office in the UW-Madison Mosse Humanities Building. As the World Series begins, the most powerful man in baseball readies a nest in Madison for retirement. It contains bubble gum, pretzels, a basket of baseballs and a cable connection to Major League Baseball's TV channel. Allan H. "Bud" Selig has charmed the UW-Madison history department, paid a million-plus for a professor to teach the history of sports and had scholarships created in his honor. His new office in the Humanities Building is cozy and modest. The effect of his presence will be the opposite. Selig, 77, owner of the Milwaukee Brewers from 1970 to 1992 and commissioner of Major League Baseball since, will retire in 2012. His intention to return to his alma mater to write his memoirs, and to create a legacy in his chosen-but-not-followed field of history, has been in the works for at least a few years. "One of the favorite parts of my life was the four years I spent in Madison, and I always thought I would be coming back as a history professor," Selig said Tuesday. "I can't tell you how much I am looking forward to it, to write my book and do what I want to do in Madison," he said. The department is getting ready to search for a professor to fill Selig's endowment wish — and preparing for sightings of the commissioner wandering the maze of halls and giving a lecture or two, said department chairwoman Florencia Mallon. "We're not hiring (the professor) this year, but there is a very good chance, if all goes to plan and the commissioner is on board, we will be hiring next year," Mallon said. Not only will Selig be on board, he will be on site, in two small remodeled rooms tucked into the brutish Humanities Building on Park Street, a pop-fly away from the Wisconsin Historical Society, where plans are under way to archive Selig's papers. "He will be working on his memoirs and be fully engaged in the life of the department, and we thought it would be a good investment of gift funds," said Gary Sandefur, dean of the College of Letters and Sciences, when asked why Selig gets an office. The commissioner's office paid for the furniture, Sandefur said. The space is comfy, not presumptuous. If it made a statement, it would be: "Have a seat. Want a pretzel?" Selig has already made a few appearances, Mallon said, giving guest lectures and getting used to the place. Selig's executive assistant, Mary Burns, was responsible for turning the two rooms into a pleasant environment for study and, of course, watching baseball on television. 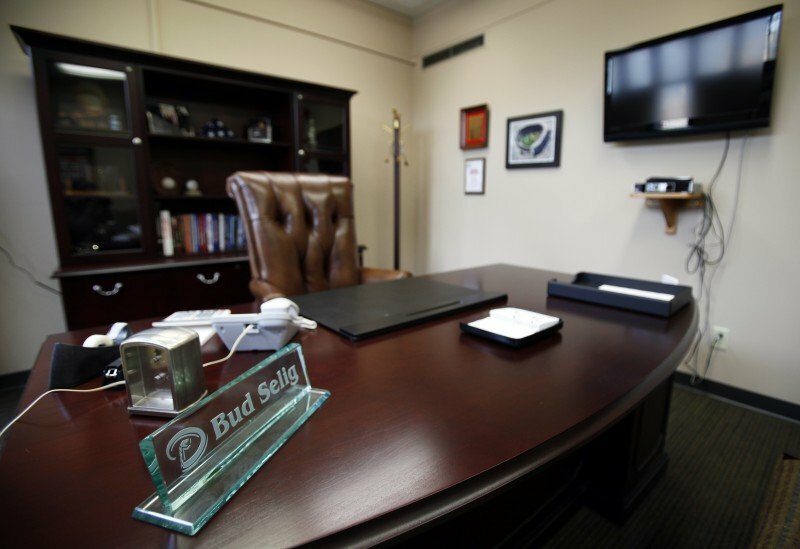 A baseball theme, muted and uncluttered, is woven throughout the sand-colored rooms, with two small desks for two employees in one room, and Selig's larger desk in the other. There is a bowl of Dubble Bubble gum, a container of pretzels, a stack of Brewers schedules, a photograph on the wall of the old County Stadium. On a shelf, there is a jar of "County Stadium Infield Dirt," a Rawlings glove, a Badgers red-and-white football, photographs of Selig giving the commencement address at UW-Madison in 2009, and of the Seligs with President Barack Obama. In the corner are four baseball bats. There is no sign on the office door. Mallon said she was grateful for Selig's financial contribution but also impressed with his devotion to the subject and his informality. "He's kind of fun," she said. "He seems to be a modest man, a sharp but regular guy." Though in 1956 Selig's history classes were probably in Bascom Hall, there is at least one nearby reminder of his college days. Three blocks away a building carries the name of his college roommate, Herbert Kohl. Allan H. "Bud" Selig's endowed chair in the UW-Madison history department wasn't his only financial splash. 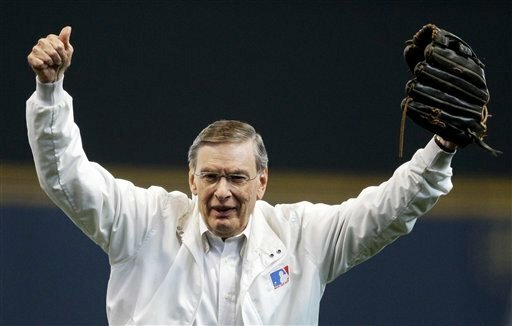 Baseball owners say Commissioner Bud Selig will be offered a contract extension at this week's meetings in Phoenix, even though he has frequently said he plans to step down in December and has set up an office at the University of Wisconsin where he plans to write his memoirs.